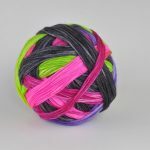 Double Sock is a hand wound ball of yarn with 2 strands of yarn dyed together to provide two virtually identical socks.. Timber Yarns, a locally run company in the Guelph area has selected All Strung Out to be their store of choice to provide this amazing yarn to you the avid sock knitter. Knit these socks 2 at a time without dividing the skein or ball into two and you still will have matching socks without having to move one ball over the other again and again. Amazing. With many colorways you will won’t be able to stop at 1 pair. The designer teases you with each and every color wound in uniform fashion so you see the next color and the next color as you knit. Work this yarn alone or with Timber Yarns 20 gram Mini Skeins in matching or contrasting solids or striping to provide funky designs or that slightly larger than normal sock.